Other schools for one off visits especially in the summer. Also some work on a 1 to 1 basis. Hard copies have been distributed to local schools. 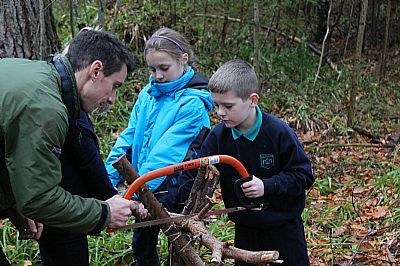 The newly developed education pack will be available for visiting schools to use in support of programmes run at Evanton Wood, packed with ideas for use in and out of the classroom the pack is a great resource for teachers and visitors alike. It is available as a hard copy and as a download. 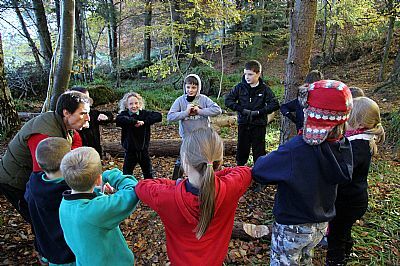 Outdoor Learing at Evanton wood can support many of the aims of the curriculum for Excellence and can offer a diverse number of approaches to teaching. 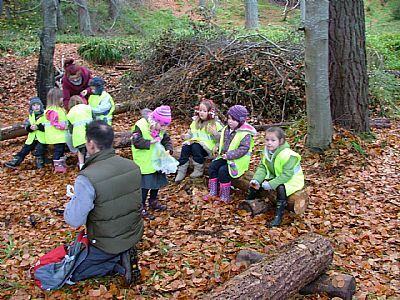 From numeracy to literacy to science and the arts, the ever changing nature of evanton woods and its variety of habitats can help make learning fun and challenging. For more information on programme planning, session guidance and links to the CfE contact Simon on 07947772066 for a chat about what we can do together to help support learining in and out of the classroom. Simon Harry has recently been appointed education and outreach coordinator for Evanton wood. Simon has over 20 years experience in the field of environmental education and has worked both in the UK and overseas developing and delivering outdoor learning programmes. Simon is a qualified Forest School tutor delivering all levels of Forest school training and is also a Scottish Cycling coach and Scottish mountain bike leader award tutor. If you think you have any pearls of wisdom or would like to help Simon get to know the wood better he can be reached on simon.harry@forest-education.co.uk or on 07947772066.